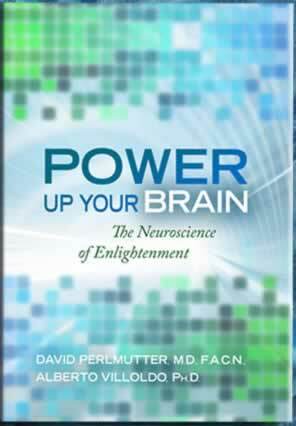 This past month, I’ve been reading an incredible book called “Power Up Your Brain: The Neuroscience of Enlightenment“ by David Perlmutter, MD, FACN and Alberto Villoldo, PhD. Dr. Perlmutter is a neuroscientist, Dr. Villoldo a shaman. Interesting, to say the least! This book is full of information that looks at the whole body and the effects of stress and trauma not only on the physical body but on the emotional and mental body. It’s also packed with new discoveries about the brain as more research is being done and dispelling myths. I would like to go over the information given about the brain’s evolution and how that affects us today. As I read the book, I made notes and I’ll use those notes to write this blog. However, I strongly recommend that you add this book to your reading list because I’ll only be scratching the surface of the information that is given within. Although your brain has unlimited potential, currently it relies on the neural networks created by the prehistoric, survival-at-all-costs brain regions – the reptilian brain and the limbic brain. The first brain is the reptilian brain, which is anatomically very similar to the brain of modern-day reptiles. This area of the brain is completely instinctual and only concerned with survival (involved in the fight or flight response). It regulates the autonomic functions of breathing, heart rate, digestion and body temperature. It feels no emotions at all. The second brain is the limbic brain (or mammalian brain) comprised of the amygdala, the hypothalamus and the hippocampus. In the limbic system, signals brought to the brain from the five senses are decoded according to the four F’s – fear, feeding, fighting and fornication. This is the brain of instinct and emotion programmed in us according to the cultural environment we grew up in. Through it we develop behaviours that keep us out of harms way. The hippocampus acts as a way station, acquiring information from the five senses and sending it out for processing via the amygdala (if there is a perceived threat the amygdala governs our fight-or-flight response) or via the cerebral cortex for all other information. When the hippocampus begins to deteriorate (as a result of free radical damage and oxidative stress from trauma and long-term stress), new experiences are less likely to be stored and remembered (seen in diseases like Alzheimers). Luckily, you can overcome the toxic emotions of your old wiring , and the conditioning based on negative experiences from the past. You can heal the old brain and create new neural connections – thereby engaging newer, higher, more evolved brain structures – the neocortex, the prefrontal cortex and the anterior cingulate. This brain can think in terms of time and space. It can store food for the winter, mark the turning of the seasons, and plan and recognize future actions and consequences as good and bad, right and wrong. The neocortex can restrain the Four F’s of the limbic brain and is involved in meditative and transcendental experiences. “Thousands of years ago, our ancestors faced a neurological opportunity similar to the one we face today, an opportunity that facilitated an evolutionary leap forward. With the awakening of the neocortex, our forebears acquired a new brain structure that nature had wired for joy, creativity and innovation. DHA (docosahexaenoic acid) found in rich supply in fish and mollusks, is a brain food that has become increasingly scarce in the human diet of today. However DHA provided the neuronutrient boost that brought the prefrontal cortex online. The new brain, however, understands that we do not have to live in a continuous state of threat – or to be constantly striving for wealth and in constant conflict and competition to justify greed. “It comprehends, rather, that we are all interconnected, that we can practice compassion by ‘turning the other cheek’ . . . and that physical ‘death’ is really an opportunity to return to a heavenly realm.” This higher mind-set calls out to the ways of love. The most recently developed part of the brain is the anterior cingulate, which mediates empathy, social awareness, intuition, compassion and the ability to regulate emotion. “Its functionality, or lack thereof, helps determine whether our day-to-day behavior is reflexive and fear-motivated or is a manifestation of our uniquely human ability to recognize a wide array of choices, implications, and consequences.” Meditation and other spiritual practices strengthen the anterior cingulate while also calming the primitive amygdala. It’s interesting, but not surprising to discover that anger produces the opposite effect to meditation. Anger shuts down communication to the prefrontal cortex. Emotion and fear determine and dominate behavior. However, when you intensely and consistently focus on your spiritual values and goals, you increase the blood flow to your frontal lobes and anterior cingulate, which cause the activity in emotional centers of the brain to decrease. Tomorrow, I’ll discuss the role of the mitochondria and how they control the fate of the cell. I’m so sorry that I haven’t been writing lately. The call of the garden has been strong and I can’t seem to resist. I’ve reworked several of my planting areas this spring and bought lots of new hostas to brighten up my shade. Thank goodness that Bradford nursery had a hosta sale! 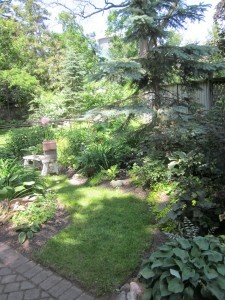 Here’s a photo of one of the newly revamped areas. However, while I have been working in the garden, it hasn’t stopped you from asking questions about food. Recently someone asked me about making nut milk – and in the attached recipes there is a recipe for hazelnut milk. Really making a nut milk is very simple. You just soak your chosen nut overnight, then in the morning blend it in a food processor until very smooth. You can add a little vanilla to the blend for flavouring but it isn’t necessary. You can drink it like that with all of the nut fibre (more of a smoothie than a milk) or you can choose to pour it into a nut milk bag and ‘milk’ the milk part from the fibre and drink it like that. Here is the link to the pdf I made of the recipes we used at the retreat in June for Caroline Dupont. It was a cleansing retreat so the meals are all vegan, containing no flours and no hot oils. These recipes are written down on the fly so there may be some jigging that you need to do. I’ll keep trying to perfect them as I make them a couple of times. Caroline has held this retreat several times now at the Loretto Maryholme Centre in Sutton – here’s the link. Although you can visit the web site to see photographs of the facilities, you need to experience the peace of this place to really see its beauty! I made the rice and bean salad from Sunday lunch again, and added the juice of 1/2 a lemon to it to give it a little more zing. And Sherri made the chick pea patties as a loaf in a 9 x 11″ pan to serve more people. Faster and easier to put together than making the patties individually. Click here for the cleansing retreat recipes. When you click in the areas outlined in green on the menu pages, you’ll jump right to the recipe. If you make any of these dishes, please let us know if you made any changes and how they turned out!